Oct 2-4, 2017) $200 (tuition only) Status: FULL - 7 of 7 spaces booked! Adirondack Mountains offer some of the best foliage viewing anywhere in America especially for the vibrant red colors of the sugar maples. From lower mountain top peaks we can overlook red-filled valleys nestled below the High Peaks, and down below the forests are filled with bright yellow and reds which make for amazing forest compositions. Lakeshores offer reflections of color on calm mornings, with abstract patterns of white birch trunks and red maple trees offering telephoto and panoramic options. Autumn season in the Adirondacks is truly a special time of year, just after most tourists have left the Adirondacks and gone home leaving the woods and waters quiet, and yet still there is an explosion of autumn color both on the trees and covering the forest floor. This is also the best time of year for photographing panoramic vistas with crisp late autumn days with low humidity and long sight distances in the clear air. Schroon Lake, the location of many of our workshops over the years, provides some excellent nearby forests and forest streams to photograph among. Finally we'll touch upon the eastern High Peaks area to photograph these classic areas as well. The price of the workshop is $200 per person, inclusive of tuition only. Photographic locations on this workshop will thus be around Schroon Lake, and part-day excursions further afield to Belfry Mt, the Pharaoh Wilderness region, Elk Lake Preserve (private access only), Keene Valley region of the High Peaks, and/or other locations. We will do 2 indoor intensive photography editing and critiquing sessions, based out of the Silver Spruce Inn. This 2.5 day Adirondack photo workshop will start at 4:00pm Tuesday October 2nd and conclude at 12:00pm Thur October 04th, 2018. Overnight base location will be Schroon Lake which is easily accessible and ideally located in the Southeastern Adirondacks, at the Silver Spruce Inn bed and breakfast, which is old-style Adirondack B&B rich in regional and prohibition-era history, with a charming host and excellent facilities to host our group. Website: www.SilverSpruce.com . Please call up Silver Spruce Inn to reserve your room, which are already blocked out under the trip leader's name, or alternatively contact the trip leader to enquire about possible room- mate matching service before booking a solo room. The Adirondacks:The Adirondack Park is a large protected region in New York State known for its lakes and wilderness canoeing routes, its rolling forested mountains and hiking trails, and its wild forests and fauna. It is the largest publicly protected area in the contiguous United States, greater in size than Yellowstone, Glacier, and Grand Canyon National Park combined. Nearly half of the Park’s 6 million acres are protected to remain as “forever wild” state forest preserve, with a harmonious blend of private and public lands giving the Adirondacks diversity found nowhere else. 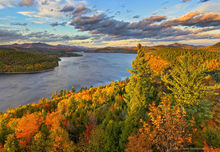 The Adirondack region boasts over 3,000 lakes, 30,000 miles of rivers and streams, and a wide variety of habitats, including globally unique wetland types, old and new growth forests, and alpine vegetated mountains. The Adirondack Park was created in 1892 by the State of New York amid concerns for the water and timber resources of the region. The Adirondacks are an ancient chain of mountains, with great hiking. Numerous trails lead up small mountains with open tops giving great views over the forested valleys below, and bountiful lakes and rivers provide recreational opportunities. Photography throughout the seasons: The timing of these photo tours coincides with seasonal highlights of the Adirondack Park. For spring workshops, the fresh, saturated lime green color of new foliage growth lasts for about 2 weeks, and along with rushing springtime rivers and streams, fiddlehead ferns, and forest wildflowers, all contribute to excellent stream and forest photography. In summertime, highlights of nature include fog lifting off the lakes on early August mornings, enjoying the warmth of the Adirondack summer season, and tranquil summer sunsets. Autumn workshops coincide with peak fall foliage season, where bright reds and yellows fill the valleys, and the air is usually crisper and clearer allowing for distant views of the rolling mountains. The autumn season in the Adirondacks is simply sublime, and quite possibly the best time of year to photograph this diverse and wild area. Depending on the selected workshop and to some extent weather, we have many photographic areas around the Adirondack Mountains from which to choose. Some of our favourite general areas include the central Adirondack Mountains around Blue Mountain Lake and Long Lake, the High Peaks region around Keene Valley and Lake Placid, the Schroon Lake Pharoah Wilderness region, and the Sacandaga River region. Of course, we focus on one area of the Adirondacks on each weekend workshop (being based out of a centrally located small town), and we will tailor our specific shooting locations to match and compliment the day’s weather, whether that's more intimate forest and stream scenes on a wet rainy day or grand vistas for a spectacular sunrise or sunset on a clearer day. During our time photographing together, we may hike up a small mountain for sunset views over the rolling Adirondack hills or for views of colorful lime green springtime or autumn season red and yellow forests below, photograph intimate forest streams and cascades, photograph the morning mist coming off a wilderness lake, or take a sunrise paddle on yet another lake to glimpse the loon and hear its call. Photography & Learning: These weekend photo workshops focus on in-the-field photography and situational instruction working alongside your leader, and as weather, light, and time allow, we'll balance this with indoor presentations or editing sessions to supplement what we're practicing in the field critiquing and editing sessions. Some photographic locations will necessitate moderate hiking on trails to get to, as hiking is an integral part of capturing the Adirondack landscape. A maximum group size of 7 photographers ensures you will receive ample personal photographic coaching in the field and maximize the group’s flexibility and ability to shoot more places, more spontaneously based on light and weather. Pro photographer Johnathan Esper will be leading the tour, who has an intimate knowledge of the Adirondacks from growing up in them. He is a recognized and established local Adirondack landscape photographer, frequently published by the region's premiere magazine Adirondack Life. Johnathan specializes in panoramic landscapes, especially of the Adirondack region, and adventure photography, and photographic topics that will be covered while shooting include HDR (High Dynamic Range) imagery, panoramic photography, people in the landscape, and of course classic landscape photography techniques. Workshop Details: These workshops are an affordable and superior way to get to know the Adirondack wilderness while also honing your photo skills. The workshop price includes all professional photographic instruction and guiding. Participants must have their own transport to our shooting locations, and book their own accommodations in a pre- determined local town for any nights. Meals are also at the participants' own cost, and we typically will eat dinner as a whole group at pre-booked restaurant. Typically the group will convene before sunrise and do a sunrise and morning shoot, and afternoon photo outing and/or an indoor session, and then again photograph in the late afternoon and straight through sunset. Meals are always worked around our photography schedule, not the other way around, but of course we always set aside some break time for meals or rest. Sign up: When you are ready to sign up, please make a deposit payment of $50, including your details, on this website's generic payment page. Or if you have any additional questions, Johnathan would be happy to speak with you; please use the contact page.